If you have an adjustable-rate mortgage, you interest rate may vary from month-to-month, or year-to-year, based on the index associated with your loan. There are a variety of “mortgage indexes” in use today that these mortgage loans are tied to, which we will discuss at greater length below. Put simply, when you take out an ARM you are assigned an index, which is variable, along with a margin, which is fixed. This margin is basically the markup beyond the index that is used to come up with your fully-indexed rate. Assuming you have an ARM, you’ll probably want to know what index your home loan is tied to. And the associated margin too. To find your index and margin, go to page 4 of your Closing Disclosure (CD) and look at the bottom of the page for the Adjustable Interest Rate (AIR) Table. It should list both the margin and the index, with something like “LIBOR12M,” which is the 1-year LIBOR. When these indexes move, your interest rate may increase or decrease if you’re in an adjustable-rate mortgage. Most banks and mortgage lenders don’t highlight the index unless it’s tied to a negative-amortization loan or a monthly-adjusting loan program. They usually just focus on the initial start rate and corresponding monthly payment. Typically, a bank will stick to one main index for the bulk of their products, with the lender I used to work for and many others opting for the LIBOR, as it tends to be the most accurate and up-to-date mortgage index available. Once a loan becomes adjustable, the fully-indexed rate is determined by adding the index and the margin. So if the index is 1% and the margin is 2.5%, the fully-indexed rate is 3.5%. The margin is disclosed when applying for a loan and never changes during the loan term. Just keep in mind that periodic and lifetime caps can limit the movement of an ARM, regardless of how the index moves. The prime rate moves when the Fed decides to adjust the federal funds rate at their monthly meetings. It can fluctuate greatly or not at all depending on the state of the economy and the rate of inflation. When inflation is too low, the Fed may move the fed funds rate lower to spur lending, but when the economy is moving too fast, the Fed will often raise the fed funds rate as needed to tame inflation. The prime rate mirrors this movement. So if the fed funds rate is increased 0.25%, expect the prime rate to also go up 0.25%. The good news is these rate increases or decreases are very telegraphed and don’t happen too frequently. Loans based on the prime rate are typically expressed as “prime plus X%,” with the addition being the margin. A common HELOC advertisement may read: Prime + 1.00%. So if prime is 4% and the margin is 1%, your fully-indexed rate would be 5%. This can then adjust higher or lower over time based on Fed policy. The CODI is based upon the 12-month average of 3 month CD accounts. CD accounts tend to be rather volatile, which carries over to this index. It still conforms to other major indexes, but does so in a more sporadic manner. The 11th District COFI is based on the cost of savings institutions in California, Arizona, and Nevada. It is probably the most steady and slow moving of these mortgage indexes, but tends to be higher. The main basis for this index comes from the interest paid on savings accounts with longer maturities, so the relative lag-time creates a slower reaction time to market. COFI-based products can be the best way to maintain a steady rate on an adjustable-rate mortgage loan program. 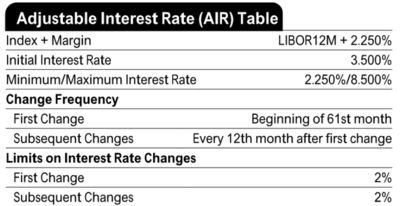 The COSI is based upon the average of all interest rates on World Savings deposit accounts. It tends to mirror the rate World Savings offers on deposit accounts. It’s a very stable index with about a one-month lag due to it’s price being based on the prior months total annual average of interest on deposit accounts. The LIBOR is known as a rather aggressive index, derived by what participating banks in London offer one another for interbank deposits. It is one of the most common indexes used for adjustable-rate mortgages. It comes in a 1-month, 3-month, 6-month, or 1-year deposit rate. Typically, LIBOR-based ARMs come with a lower margin for homeowners looking to secure a more attractive initial rate. The LIBOR is being discontinued soon and is set to be replaced by a new measurement that aligns with the current index. It is expected to be replaced with the Secured Overnight Financing Rate (SOFR) by 2021. The CMT is the average yield on U.S. Treasuries adjusted to a maturity of one year. It tends to be slightly lower than the rate on the 1-month LIBOR. However, the associated margin might be higher to compensate. The MTA is slightly more conservative than the LIBOR, although it boasts a higher margin, so your initial rate will tend to be higher than a LIBOR-based home loan product. When mortgage rate shopping, be sure to pay attention to both the margin and the index to determine what the fully-indexed rate will be in the future. If you focus on one and not the the other, you could be in for an unwelcome surprise. Read more: How are mortgage rates determined?